You would go a long way to find a better place than Highclere Farm for comfort and style. Add to this the stunning Hunter location that is The Paterson Valley - Heaven! 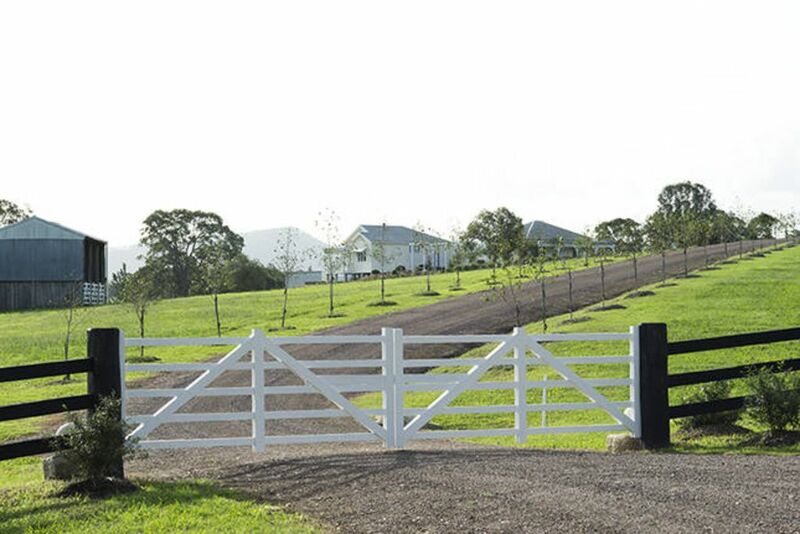 You know you have arrived somewhere special when you are greeted by two gleaming white 5 bar gates, the entry to your very own 50 acres on the Paterson River. The exterior is the ideal country homestead with a fresh cream and white façade, colonial architraves, and wrap-around porches or huge decks for views of the rural backdrop. Inside is all country chic, reflecting the owners' Australian and English heritage. Modern amenities (including air conditioning, gourmet kitchen appliances, an LED TV and DVD with an eclectic mix with restored furniture and vintage collectibles. The homestead accommodates up to 10 adults offering 5 bedrooms, 3 bathrooms and living rooms across the two pavilions. There are 4 Queen bedrooms and 1 twin bedroom. Our rates assume 2 persons per room so you can choose to have 3, 4 or 5 bedrooms opened for your use when making your booking. Please talk to us about a rate that best suits alternative arrangements that may suit you. There is a two-night minimum booking requirement with a three-night minimum over public holidays. * Country gourmet kitchen with Ilve oven, Smeg fridge, microwave, toaster & dishwasher. All necessary utensils provided. An easy 2.5 hours’ drive north of Sydney, Highclere Farm is the perfect weekend escape. Secluded, peaceful and private, it is an ideal setting for a couple or your family and friends to spend time taking in the magnificent views, rambling, playing games, cooking relaxing. The Hunter Wine Country forty five minutes away. An ideal setting for wedding parties for those getting married nearby. Bring your own horse by prior arrangement. * Feasting at Highclere: be sure to buy local meat at the local Paterson Butcher or order from nearby Redgate Farm your gourmet fowl (quail, partridge, ducks, spatchcock, and free range chicken). This valley is where Dorothea MacKeller wrote her famous poem “I love a Sunburnt Country” and Captain Thunderbolt the highwayman wandered. The property was all we expected such a beautiful spot with all your needs met - we loved it! What a lovely person to work with Lee was just so helpful and made our stay just wonderful and uncomplicated. It is a beautiful location perfect for our book club to sit and chat and picnic in the grounds. The property and houses are just lovely. We had such a relaxing time. A lot of effort has gone into the decorating and furnishing of Highclere and it really shows as you feel so comfortable from the moment you arrive. The gardens also are just amazing. Perfect to sit back with a drink and watch the sun set over the hills. We'll definitely be back for another visit. Thank you so much Sam and family and glad you enjoyed Highclere so much! Highclere Farm is a stunning property, and perfect for a luxury getaway! The house is beautifully styled, well equipped with heaters and a fantastic kitchen. We left feeling very rejuvenated! We are so pleased you enjoyed your stay Will and are so leased you see what we see! Thank you all too for looking after Highclere so well. Highclere is the perfect destination for a luxe country escape. Our family of 4 found the property to be beautifully furnished and very well equipped. Host Lee was a delight to deal with, extremely professional and most hospitable. The farm and surrounds are breathtakingly beautiful. There were 10 of us who stayed there and we had a wonderful time. The house is beautiful decorated and the gardens are just amazing. The beds are super comfy, and the kitchen is stocked with all the items you need to cook up yummy food. Thank you Edward & Lee for letting us stay in your beautiful house. Thank you Kate and to your friends - we are so pleased you loved it and for being such attentive guests too!